An article by Brendan Maslauskas Dunn about military infiltration of an anti-war group around the Port of Olympia. Ian Minjiras walked out of the anarchist community space Pitch Pipe Infoshop in Tacoma, Wash., and ventured to an anti-war demonstration at a weapons convention where military personnel and law enforcement were in attendance. It was not his first protest, but it was the first protest where many activists met “John Jacob,” who would later be uncovered as a spy for the U.S. Army. As the demonstration wound to a close, Ian left and walked a distance to catch a bus to the other side of town. Police were later heard saying they sent undercover officers to follow Ian. He was arrested and accused of scrawling graffiti on a wall. While he was being booked, the police confiscated all of the anarchist literature in his backpack that he had just picked up at Pitch Pipe. He spent the night in jail but was eventually let out. This is a common story at demonstrations—the rally, the arrest, the time in jail. What is not so common is what happened to Ian in the aftermath. In 2007, his name, along with the names of at least three other activists, was entered into a Domestic Terrorism Index. His crimes were that he attended an anti-war rally and had some anarchist literature. Ian is not alone. He is one of many activists who have been targeted and spied on by the U.S. military in what is perhaps the most expansive surveillance network targeting radicals in the United States since the tumultuous days of the Federal Bureau of Investigation’s (FBI’s) COunter INTELligence PROgram (COINTELPRO). That secret FBI program was created to destroy the Civil Rights and New Left movements of the 1960s and 1970s. Since it was uncovered, it has only evolved in more secret ways. Currently, a team of lawyers is taking on the U.S. military with the landmark civil liberties case Panagacos v. Towery. This story, however, starts well before the U.S. government labeled Ian as a terrorist. It starts in the streets of the small port city of Olympia, Wash., in 2006. I remember the feelings of excitement, anxiety and uncertainty that surrounded the Stryker Brigade military shipments that came through the Port of Olympia in May 2006. What started off as just several protesters getting arrested for standing in the road and blocking Stryker military vehicles rapidly grew into hundreds of people, day and night, descending on the port, attempting in vain to stop or slow down the war machine. Activists came up with the name Port Militarization Resistance (PMR) to describe the network of people who started to take decisive action against these shipments. Dozens were arrested and many more were attacked by the police. PMR was one of many organizations that took part in the port protests—the IWW was another. Although we were not successful in stopping the shipments, there was no turning back. We had ignited a spark in the anti-war movement, one that suggested that civil resistance and directly confronting military shipments was a more logical approach to ending the wars. To this day, activists reminisce about the time 200 of us marched to the port entrance chanting, “War machine! Tear it down! War Machine! Tear it down!” It was an electric feeling, one the military did not want to spread. Deployment after deployment, the military changed its tactics to avoid us. Instead of shipping convoys in broad daylight, they used the cover of night for future shipments through the more desolate Port of Tacoma. The Port of Grays Harbor was also used before the military, again, came back through the Port of Olympia in November 2007 with returning shipments. Perhaps military officials thought that there would be no resistance as these were not outbound shipments. They were wrong. Activists saw the ports as revolving doors. We knew that these Stryker vehicles would be repaired and shipped right back out again to continue in the senseless slaughter. The model that PMR created was contagious. Activists in New York City shut down a military recruitment center in solidarity with one of our actions. There was a short-lived attempt to start a New Yorkbased PMR. Unionists in the International Longshore and Warehouse Union (ILWU) in the Port of Oakland made connections with us to organize their own actions while Hawaiian activists were in regular discussion with us as well. 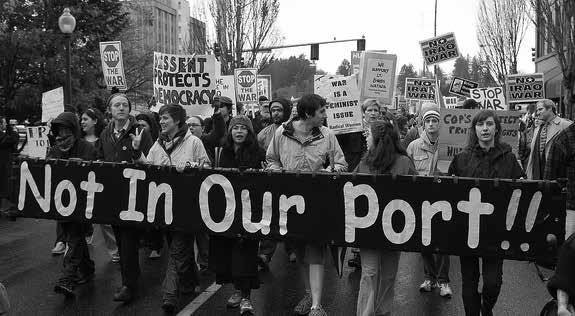 Olympia and Tacoma became the epicenter of the antiwar movement. All eyes in the movement were on the Pacific Northwest. In addition to the resistance in the ports and streets, there was a parallel resistance evolving in the ranks of the military. Lt. Ehren Watada refused to serve in what he saw as an illegal war in Iraq. Suzanne Swift went AWOL (absent without leave) when she was asked to ship back out and remain under the command of a superior who had raped her and put her on suicide missions whenever she refused his advances. PMR activists helped build political movements supporting Watada and Swift and made their stories national news. Many other soldiers refused to fight in Iraq and Afghanistan. Some did it publicly, asking for our support and going to the media with their stories. Most did it quietly. At least one soldier who went AWOL joined PMR. For the first time, these soldiers realized who their true enemy was. Iraq Veterans Against the War (IVAW) became very active in the Northwest. The group established an anti-war G.I. coffeehouse called Coffee Strong just across the street from the massive military base Fort Lewis (now called Joint Base Lewis- McChord). It was not uncommon for soldiers to show us peace signs and clench their fists in the air as they drove by during military shipments. Off duty, soldiers approached us in tears, telling us they were preparing for their third or fourth tour of duty and thanking us for taking action. One soldier, in what might be called an act of mutiny by his commanding officers, refused his orders to ship more vehicles and marched out of the Port of Olympia to a jubilant crowd of protesters. The situation was becoming a threat to the war efforts. Militant, raucous demonstrations followed the Army wherever they went. Soldiers and workers at Fort Lewis joined PMR. More and more soldiers refused to fight. Public opinion was not only turning against the wars but was turning into direct action to end the wars. The Army had to do something to put an end to this so their mission could continue unabated. This is where John Jacob entered the scene. John said he worked as an information technology (IT) specialist at Fort Lewis and was an Army veteran. He was around 40, donned a beret and wore IWW and anarchist buttons. He was welcomed with open arms into the anti-war and anarchist movements. He became very active with PMR and spent much of his time hanging out at the Pitch Pipe Infoshop in Tacoma. I considered him not only a fellow activist but a friend. We gave a workshop together on community organizing at the Tacoma Anarchist Book Fair in 2007. Suspicious individuals came onto the scene. Many of us were routinely harassed. My house in Olympia, where I lived with several other activists, was under almost constant surveillance by police. They regularly parked their cars across the street, facing our house, and often came onto our property to harass us. I also discovered that the police at the college I attended kept a picture of me on their wall alongside that of another PMR activist for reasons I am still unaware of. In Tacoma, a surveillance camera was secretly installed on a utility pole across the street from Pitch Pipe. In September 2007, and again in the same month in 2009, I was detained and interrogated by Canadian border officials on trips to British Columbia. The first time, they threatened to put me in a Canadian jail without charge, temporarily confiscated my passport and deported me. The second time, I was informed I had an FBI number. A criminal trial called the Olympia 22 that stemmed out of the 2006 port protests was also sabotaged by law enforcement (and later, we learned Towery was in on this) when they hacked into our attorney-client listserv. Former IWW General Secretary-Treasurer (GST) Sam Green and I were both in this case. But there was one thing that tipped us off and made the Olympia IWW branch decide to file a public records request. In April 2008, the Olympia Police Department stole the IWW newspaper box located downtown. The box was given back only after a lawsuit was threatened. In response, I filed a public records request for any information on the IWW, Students for a Democratic Society (SDS) and anarchists. The hundreds of documents that were released included one that was an email sent by a John J. Towery II. It did not take long for a small group of activists to research and discover that John Jacob was in all actuality John Towery, Army informant. The jig was up for John but this revelation was only the tip of the iceberg. Other activists filed more public records requests and over the next few years we would receive hundreds upon hundreds of documents that provided fragments of information detailing a vast surveillance network. Not only was the Army spying on us, but the Navy, Coast Guard and Air Force were as well. We also learned that countless federal agencies, including the FBI, Immigration and Customs Enforcement (ICE) and the Department of Homeland Security were spying on us. Even Air Force personnel from as far away as New Jersey and the U.S. Capitol Police in Washington, D.C. were part of the network. Not to mention the seemingly endless list of local and state police departments that were involved. We discovered that at the core of this network was a fusion center that Towery worked for. Fusion centers are a shadowy post-9/11 development created to monitor “terrorist” activities and “threats to national security.” They blur the lines between local and federal law enforcement agencies and the military. There have been congressional hearings on fusion centers in the past for overstepping their boundaries and trampling civil liberties. Fusion centers have gone so far as targeting Planned Parenthood and peace groups. Occupy Austin was also infiltrated by a fusion center informant. The danger of course is that fusion centers do intelligence gathering on “threats” to U.S. national interests and in doing so see peace groups, Occupy and Al-Qaeda as all part of the same monolith bent on destroying the government. The only thing fusion centers have been successful at is helping prop up a national security state. Civil liberties and constitutional law are simply viewed as annoying inconveniences to fusion centers. There are currently almost 80 such centers in the United States. Towery’s exact role within the fusion center is still unclear but he did prepare threat assessments on local activists. He was not alone in his work. Clint Colvin was outed as a spy for the Coast Guard. Sandy Kortjohn, whose husband, Mike Kortjohn, worked in the same circles as Towery and spent his time gathering intelligence on SDS and PMR, infiltrated an anti-imperialist group in Olympia and was outed by another activist. Towery’s superiors not only knew what he was doing, they encouraged it and gave him orders. To this day, however, Joint Base Lewis McChord maintains that he was a rogue individual and did not have clearance from his superiors to spy. Documentary evidence that has come in the form of public records requests states otherwise and turns their lies into a thin veil they are finding harder to hide under. Knowledge of this surveillance went way up the chain of command, all the way up to the Secretary of Defense. It started under the Bush administration and continues, to this day, under Obama’s presidency. Towery’s role as a spy gives us a glimpse into the dynamics of this vast surveillance network. Although I cannot speak about the details yet as I signed onto a protective order, the Army recently gave my attorneys nearly 10,000 pages of discovery documents. Hopefully, the day will come when we can share these and other documents. I’m really curious about the details of this program and am confident that we will get a better picture during trial this June. The parameters of this surveillance network could fill the pages of a book. This should of course concern everyone in the union. Not just for the obvious reasons that Wobblies were spied on, including former GST Sam Green, or that our union was targeted by an institution which has the main goal of neutralizing and killing threats to U.S. governmental interests. I plan on writing more on this, on who John Towery was, and on what practical things we can take from this experience. There are some new revelations I am still wrapping my head around. I recently learned that while Towery was spying on us, he carried a concealed gun with a bullet in the chamber. I also learned that he tried to convince a friend that anarchists and fascists had much in common, that we should work together. It also seems likely that the U.S. Army was planning an entrapment case on my friends, on fellow anarchists in Tacoma. These are stories for another day. What we need to do is turn our rage over these revelations into love, into action. To take the words of one Wobbly that was murdered by the state of Utah years ago, “Don’t mourn, organize!” That’s precisely what we need to do in moments like this. Yes, repression is real. But we need to use the story of Army spy John Towery to agitate and organize other workers. We need to educate workers that this government will take excessive measures to ensure that big business accumulates as much profit as possible through perpetual warfare and propping up a national security state. You can help with this case by giving a donation to our legal defense fund. We need it. Thankfully, we have a brilliant team of lawyers representing us, including Larry Hildes, who joined the IWW during our union’s Redwood Summer campaign with Earth First! Dennis Cunningham is also helping us. He represented radicals the FBI targeted for neutralization, like Black Panther Fred Hampton and Wobbly Judi Bari. It is however a grassroots legal defense on a shoestring budget. Like Ian Minjiras, I am considered a domestic terrorist by the U.S. government. Not a day goes by that I am not reminded of this fact. The bigger question is: Does the government consider the IWW a terrorist organization? This would not be the first time that the government labels those fighting for freedom and liberation as terrorists. And it won’t be the last, unless of course we continue in our struggle to create a society rooted in true freedom, in mutual aid, cooperation, and dignity and abolish the system that shackles the poor of the world. That’s a system the military, law enforcement, both the Republicans and Democrats, the rich, and the national security state that protects all of them are deathly afraid of. We have a world to win! Let’s keep on fighting for it. Donate to the legal defense fund by visiting http://www.peoplevtowery.org.